I've been a bit stressed and grumpy lately from what seems to be an unending string of reactions, so I wanted to knit myself something happy-making. (I am working on a qiviut cowl which, while completely wonderful to pet, will not necessarily result in a fun, makes-me-giggle-like-a-child end product). 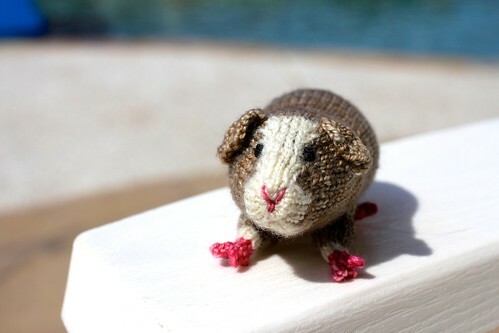 So I made myself a guinea pig. Now this makes me giggle. In other news, I was tromping around outside and noticed that there's pretty much nothing blooming. There are a few tenacious green thread and vervain hanging about, but most everything has either gone to seed or is overgrown with grasses. There are some things that I'm hoping will be gayfeather but I saw something similar start to bloom and they had small yellow blooms so maybe we are gayfeather-less (which would be sad cause it's an awesome flower). Time will tell! While I'm waiting to see what comes up in the gayfeather department (which will heavily influence when we mow over everything) we do have one potentially interesting plant popping up. I think it is eryngo, but I'm not quite sure since it isn't purple. But it's just recently shown up so maybe it will turn purple. I'll be keeping an eye out! Maybe our new guinea pig will help me watch. 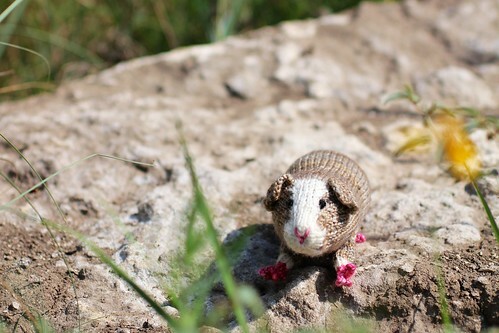 ETA: I shall call him Gilly, short for Gilbert the Guinea Pig. Be like Kei (?sp)and his yellow duck in all of their pictures. Ha, I think Gilly will be showing up in many of my future knitting pictures, much like Kei's duck! Can you translate the pattern to English? I actually just used Google translate as my Spanish is virtually non-existent. Plus, there are videos on the pattern site that, if I remember correctly, pretty much show how to knit the whole thing. It's very non-Spanish-speaker friendly!